Orrig didn’t get to be an old orc without being able to see past surface appearances. 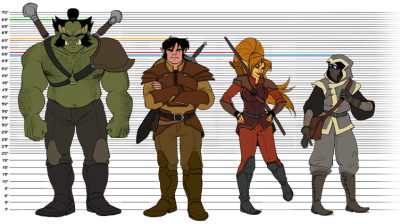 Half-orc Brent may have anger-management issues and elf Lyra may be abrasively arrogant, but under Orrig’s careful management both are valuable members of his crew. Similarly, where most people meeting Thistle for the first time might be more concerned about what she might be hiding under her mask, Orrig sees a competent mage who can fill a gap in his team’s skill set. She may be a misfit but she can be one of Orrig’s misfits. Other secondary world adventurers may prefer the life of the murder-hobo, wandering from place to place, killing people in the hope that coins will spontaneously pour from their wounds. Not Orrig. Orrig and his employees never work on spec or pro bono. Assignments and the fees on completion are laid out in contract form beforehand. While this comes with endless paperwork, Orrig never has to stab his patrons to see if monies owed spurt out. The troupe’s assignments range from dealing with rats of unusual size to exterminating anthropophagous cave elves. Thistle does not particularly mind the first sort of assignment but, as she is not a sociopath. killing people (she considers cave elves to be people) is not to her taste. But she usually does what Orrig wants; it’s the hand that Fate has dealt her and she half believes that it is all she deserves. But even Thistle has limits. When she learns a local magical academy wants to hire Orrig and his crew to watch over student mages as they try to summon demonic Drath from the pits of Hell, Thistle refuses to take part. Orrig is disappointed but persists. After all, what could possibly go wrong when one calls magically adept, soul-hungry, body-warping fiends adept at manipulating mortals? Aside from the potential end of the world, that is. Either this is set in our world after some sort of magical apocalypse or artifacts from our world (like batteries) have migrated across dimensions1. Hard to tell. Some of the place names seem familiar but … mages can pull things across dimensions. Readers can see them do it. One can tell that this comic is recent because the characters use magic to talk to each other during a classic “divide the party and send the characters into a maze of dark, twisty tunnels” excursion. I cannot think of any comics from the 80s or 90s in which magic replaces cellphones. But if you have grown up using them, you cannot imagine an adventure without them. This is what TV Tropes calls a Five Race setting. Unlike many such settings, none of the races are described as intrinsically evil. Well … the cave elves do kill and eat people, not always in that order, and they are targeted for extermination by the orcs, ordinary elves, and humans. The story does not explain whether people want to kill cave elves because the cave elves eat people or whether the cave elves adopted their current lifestyle in reaction to being targeted for extermination. The author does give us reason to believe that not all cave elves are chaotic evil. The extra-planar demonic Drath, on the other hand, do seem to be obligately malevolent, at least once they reach our world. Web comics often have well-meaning art little inhibited by knowledge of technique or basic anatomy. Daughter of the Lilies is an exception to this; both artist and colourist clearly know what they are doing. I am told these days people care about the characters in a novel. Odd, since criticizing the setting is so much more interesting (just as the sets and flats for a play are of course the piece de résistance). Those readers who want interesting characters will be well satisfied with Daughter of the Lilies. Protagonist Thistle is endearing. Her companions are not as well described, but we learn more about them as the story proceeds. I was happy enough to read this comic that, once again, I’ve binged my way through the whole archive. In my defence, I should point out that I have no self-control there didn’t seem to be a logical point at which to stop reading. Just one more. If you take a look at the comic, you may find yourself in like plight. Daughter of the Lilies begins here. 1: I can see no way in which disposing of our garbage in other dimensions could go horribly wrong. If you don't go into the cave elves' caves, do the cave elves then not eat you, or do they come out of the caves to hunt? I suppose probably the latter because there's not much to eat in caves, unless you're Gollum, and he was hungry. And a cannibal... would-be, anyway, if you don't count goblins, but do count homo tolkiens as strictly one species. The cave elves in this case were intruding into a mine. Not "intruding", they was foraging! Yeah, that's it, foraging! I enjoy this webcomic and would recommend it. The art is cartoony but this is a design choice; the artist is more than competent. There are twists but they make sense. It's firmly on my list of webcomics to follow (and my list is not really all that long).